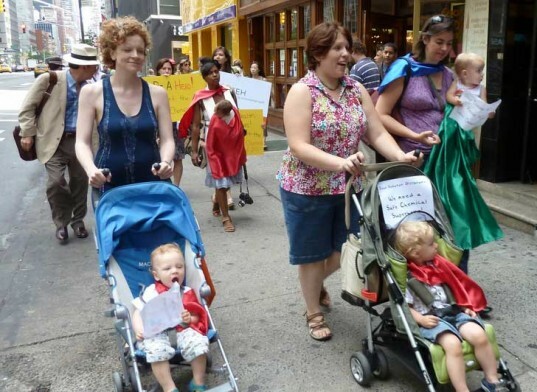 Parents around the country are organizing Stroller Brigades today in support of the Safe Chemicals Act of 2011 (S.847) that is now up for vote in Congress. 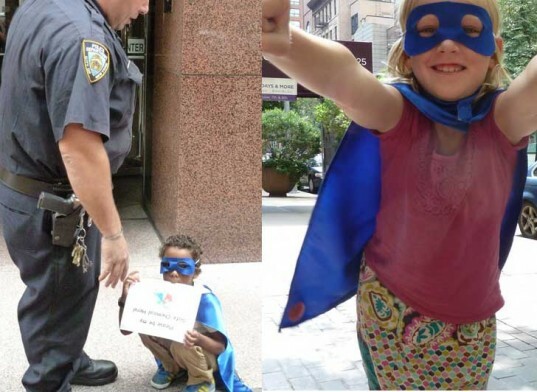 The Brigades first started this August when troops of parents and kids took to the streets decked in superhero outfits to ask their local congress members to stand up for their rights to know about toxic chemicals in products. 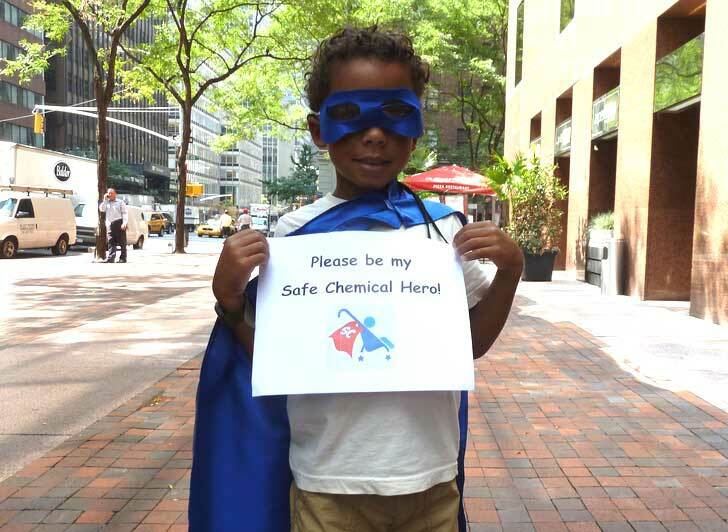 Kids carried signs asking their elected officials to, “Be a hero and co-sponsor the Safe Chemicals Act!”. Now, fanned out across eleven states, the Stroller Brigade families are standing up for all of our rights by asking Congress to do more to keep toxic chemicals away from our kids. Read on to see what the Stroller Brigades are working to change. The Safe Chemicals Act (SCA) of 2011 aims to bring the Toxic Substances Control Act (TSCA) of 1976 up to date. The TSCA allows the EPA to monitor and control known toxins such as polychlorinated biphenyls (PCBs), asbestos, radon and lead-based paint. Though the act has done a lot to keep toxins out of our lives, there are gaping holes in the law — notably food, drugs, cosmetics and pesticides are excluded from control. Enter the SCA and the kids in superhero capes who are crusading to bring attention to the fact that not enough is being done to safeguard our health. The SCA of 2011 will undo a loophole in the TSCA that allows 62,000 older synthetic chemicals to go untested due to a grandfathering policy. The SCA will also shift the burden of testing chemicals to the companies, currently the EPA is in charge of testing, which puts a huge financial and time burden on the government. Under the new law companies would have to prove, without a doubt, that the chemicals they use in products are not harmful. In addition, the law would require that companies disclose of chemicals used and their possible side effects in an internet database. The law would also expedite the action taken to remove or reduce the use of highly suspicious or toxic chemicals from the marketplace. The SCA of 2011 was sponsored by Senator Frank R. Lautenberg (D-NJ) and has 12 co-sponsors — including Senator Kirsten Gillibrand (D-NY) and Senator Barbara Boxer (D-CA). The bill is currently being reviewed by the Committee on Environment and Public Works. To help pass the Safe Chemicals Act of 2011 you can read more about how the bill will affect the health of your family and reach out to your local senators to ask them to be a hero by taking the health of your kids seriously. The Safe Chemicals Act (SCA) of 2011 aims to bring the Toxic Substances Control Act (TSCA) of 1976 up to date. The TSCA allows the EPA to monitor and control known toxins such as polychlorinated biphenyls (PCBs), asbestos, radon and lead-based paint. Though the act has done a lot to keep toxins out of our lives, there are gaping holes in the law -- notably food, drugs, cosmetics and pesticides are excluded from control. Enter the SCA and the kids in superhero capes who are crusading to bring attention to the fact that not enough is being done to safeguard our health. The SCA of 2011 will undo a loophole in the TSCA that allows 62,000 older synthetic chemicals to go untested due to a grandfathering policy. The SCA will also shift the burden of testing chemicals to the companies, currently the EPA is in charge of testing, which puts a huge financial and time burden on the government. Under the new law companies would have to prove, without a doubt, that the chemicals they use in products are not harmful. In addition, the law would require that companies disclose of chemicals used and their possible side effects in an internet database. The law would also expedite the action taken to remove or reduce the use of highly suspicious or toxic chemicals from the marketplace. The SCA of 2011 was sponsored by Senator Frank R. Lautenberg (D-NJ) and has 12 co-sponsors -- including Senator Kirsten Gillibrand (D-NY) and Senator Barbara Boxer (D-CA). The bill is currently being reviewed by the Committee on Environment and Public Works. To help pass the Safe Chemicals Act of 2011 you can read more about how the bill will affect the health of your family and reach out to your local senators to ask them to be a hero by taking the health of your kids seriously.